Artisan’s Mark Hammers by Wubbers are a high quality line of finely detailed designer hammers. They are perfect for texturing, riveting, forming, planishing, embossing, getting into tight places, and so much more. 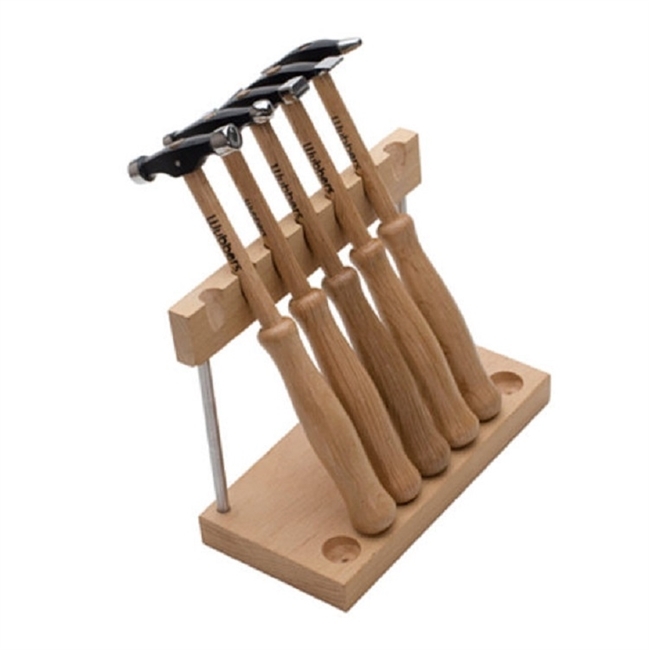 This set has five different types of hammers and includes a convenient stand to keep them handy. Artisan’s Mark Hammers are made of highly polished steel and burnish your metal as you work, saving time and making your work more productive and fun as you create the perfect finish on your jewelry designs. Featuring a stylish matte black finish, the heads are securely pinned in place, making them safe and reliable. The Wubbers Artisan’s Mark Hammers feature custom designed handles that are made of white oak, a beautiful hardwood. They are the perfect length at 8-1/2″, engineered for comfort and control, and feel well balanced in your hand. They are petite in size, yet huge in design possibilities. Make a lasting impression and leave your mark with the Artisan’s Mark Hammers by Wubbers.